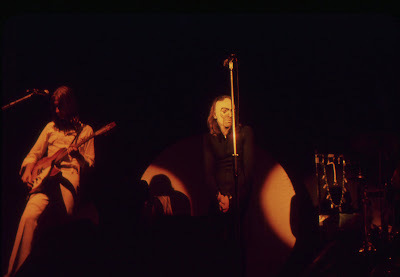 The beginnings of Genesis go back to 1967, when a handful of young students at Charterhouse, a preparatory school in Surrey, England, first joined together for the purpose of writing songs. 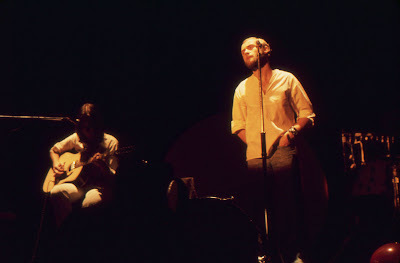 At that time, Peter Gabriel (vocals, flute), Tony Banks (keyboards), Mike Rutherford (guitar, bass), and Anthony Phillips (guitar) did not actually intend to make themselves known as performers. 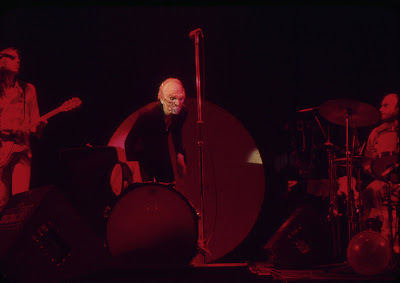 They turned their ambition to the necessity of having to perform (with Chris Stewart, another student at Charterhouse, on drums) only as an expedient means of ensuring that their songs would be heard. The five students were soon taken in hand by Jonathan King, a former student at Charterhouse himself, who was well-known as a singer ("Everyone's Gone to the Moon") and a producer ("It's Good News Week" by Hedgehoppers Anonymous). 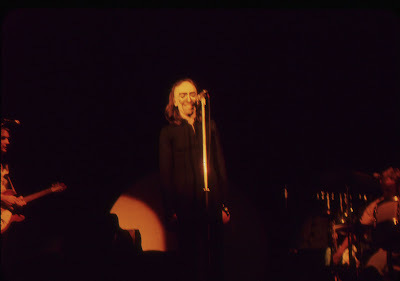 After taking the name of Genesis, and with the help of Jonathan King, their first single "The Silent Sun," was released on Decca Records in February, 1968, and was followed by the release of their first album, From Genesis to Revelation, also on Decca Records, in March, 1969. A second album by Genesis, Trespass (produced by John Anthony), was released on Charisma Records in October, 1970. 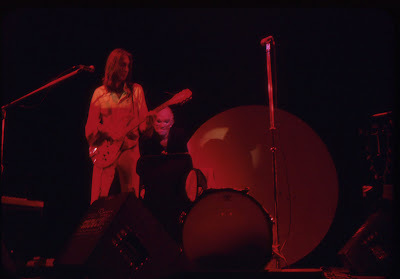 By 1971, after several members had come and gone, Genesis had settled into an accomplished membership that consisted of Peter Gabriel, Tony Banks, and Mike Rutherford, with the addition of Steve Hackett (guitar) and Phil Collins (drums). 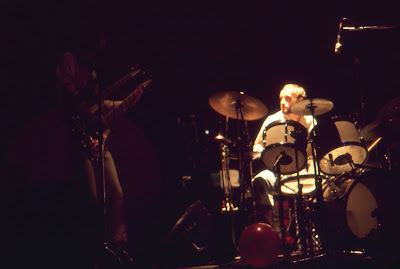 It was this lineup that become well-known and recorded the third album by Genesis, Nursery Cryme, which contained two of their most famous songs, "The Music Box," and "The Return of the Giant Hogweed." In October, 1972, their fourth album, Foxtrot, was released. Foxtrot included "Watcher of the Skies," "Get 'Em Out by Friday," and "Supper's Ready" among its tracks, and firmly established Genesis as a major act in the United Kingdom. 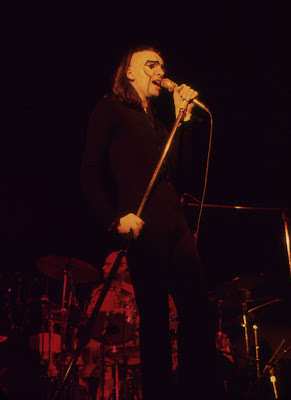 Much of the singular appeal that Genesis displayed onstage in those years was derived from the vigorous performances of Peter Gabriel. 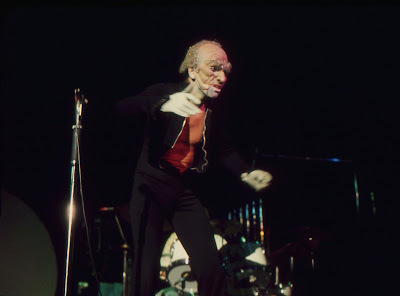 Instead of merely standing in front of the audience and singing, he took it upon himself to act out the stories in the songs, using makeup, hats, masks, and costumes, combined with props and lighting, to convey the strange qualities of the varied characters, which often were taken from fairy tales, Greek myths, and other works of literature. 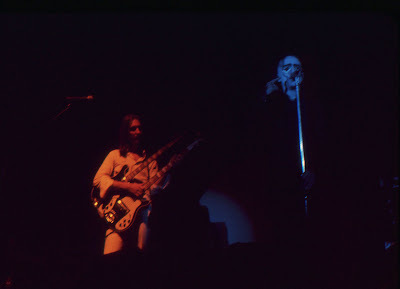 Peter Gabriel's extraordinary abilities, along with the formidable talents of his fellow musicians, enabled a concert by Genesis to reach into a special realm, far beyond the usual confines of rock'n'roll. 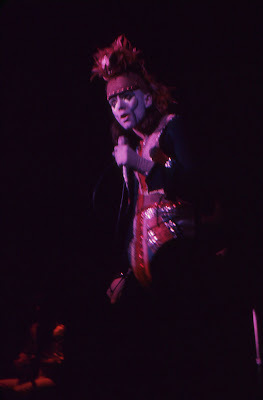 When Genesis arrived in San Francisco to appear at Winterland in March of 1974, they were promoting the release of their latest LP, Selling England by the Pound, an album that was highlighted by "I Know What I Like (In Your Wardrobe)," "The Battle of Epping Forest," and "The Cinema Show." 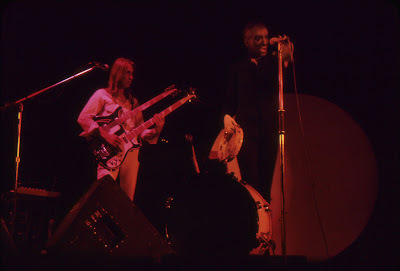 Their appearance was billed as an "Evening with Genesis," and did not feature (or require) any other performers. 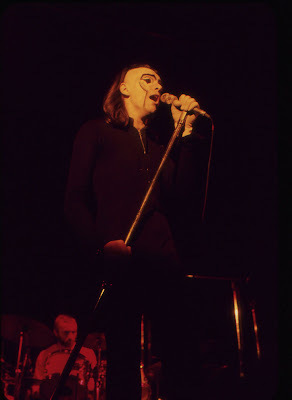 Genesis offered a highly sophisticated performance at Winterland, a performance in which they skillfully blended a number of musical and visual elements, fully living up to the awesome reputation that had preceded them and creating an overall experience that was both striking and unforgettable. 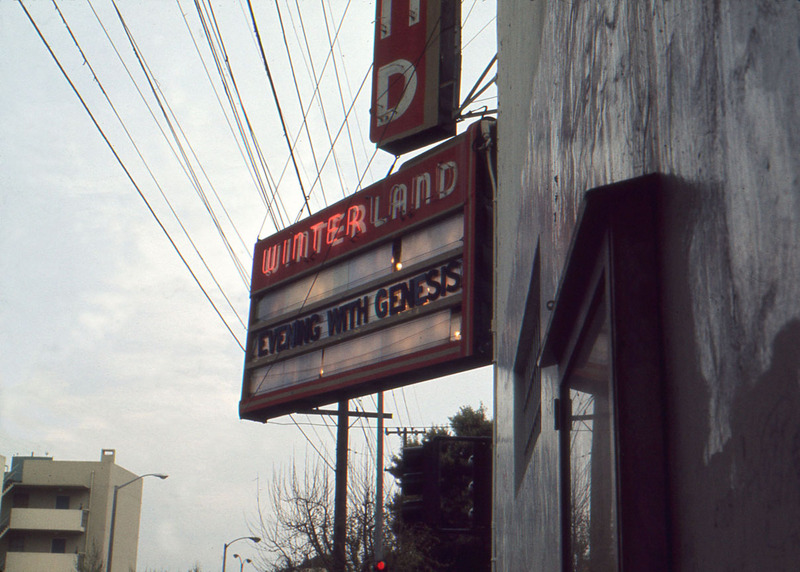 David: Nine days after seeing Yes, we were back at Winterland to see the first San Francisco performance by Genesis. 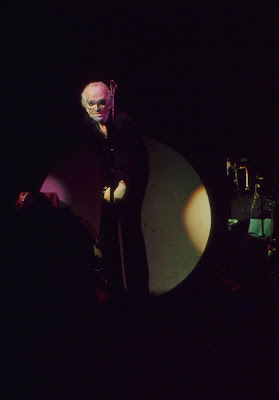 At the start of each concert promoted by Bill Graham, someone would walk on stage and announce upcoming shows. It was usually Jerry, I forget his last name. 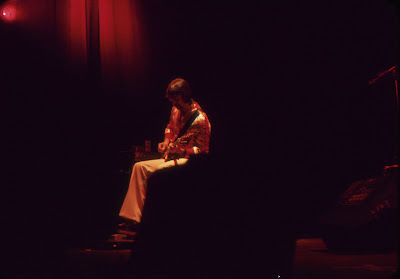 At an earlier concert, I heard him say "An evening with Ge..." and the crowd cheered so loud that I had to turn to my friends and ask them who was coming. I had never heard the expression "An evening with..." used in connection with a rock concert. I didn't know if that meant that we would sit and have tea and crumpets with the band, or what. While we were waiting outside of Winterland on the day of the concert, I saw a guy walking toward us. 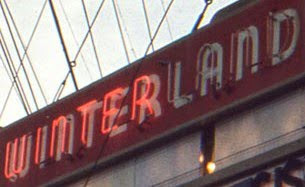 I was used to seeing all sorts of characters, and once even a naked chick, hanging around Winterland. Michael said, "Look at that jerk, trying to look like Peter Gabriel!" Then he said, "Oh, my God! It IS Peter Gabriel!!" Peter Gabriel made his way past us and pounded on a side door. Getting no response, to our amazement he started kicking the door. Finally, Gary directed him to the correct door, and after he gave us his autograph, he slipped inside. 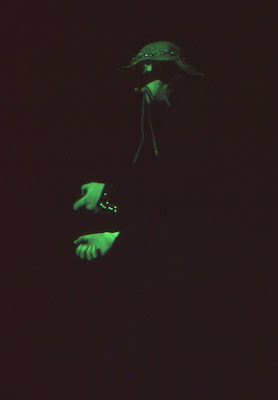 Michael had prepared us for the event, so we knew about Gabriel's frequent costume changes and theatrics. I was disappointed that there was no fox head, but the rest of the performance made up for it. 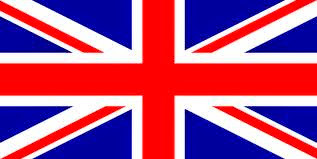 They played most of Selling England by the Pound, which had just been released. I still have a copy of that LP, which I bought at The Record House, near Winterland. 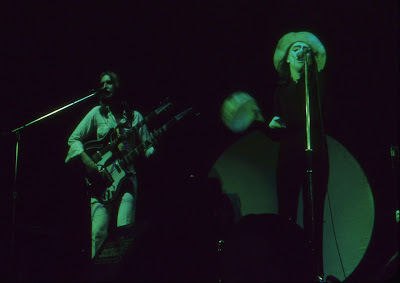 A high point of any Genesis concert was "The Musical Box" from Nursery Cryme. Peter slowly walked out in a craggy face mask that had sparkles on it. He moved hunched over and fragile, like an old man near the end of life. As the song progressed, his body took on a different stance. It was shocking to see him evolve into a young man, prancing like Mick Jagger. 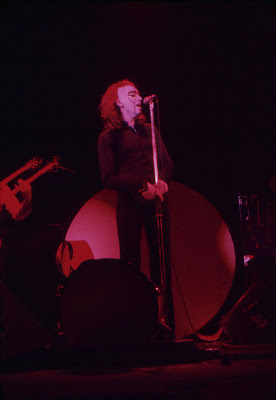 As the song peaked, he leaned over the stage right next to me and sang, "Touch me, Now! Now! Now!" A strobe light flashed under him at each "Now!" The audience grasped at him, just as he demanded. I clicked off a picture as the light flashed. Gabriel's face was frightening as he screamed the words, with hands reaching up. It is one of my favorite photographs. The last song, "Supper's Ready," was just as climactic. 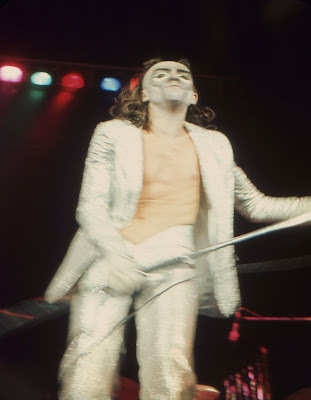 Dressed all in black, under darkness, Gabriel suddenly exploded on stage, bathed in hot, white lights, and transformed in a glimmering, silver suit. 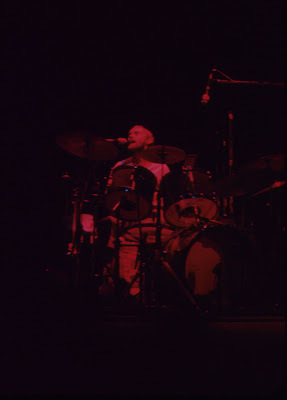 The drumming of Phil Collins impressed me as possibly the best I ever heard, although his singing did not. The musicianship of all was incredible. Steve Hackett sat down throughout the concert. 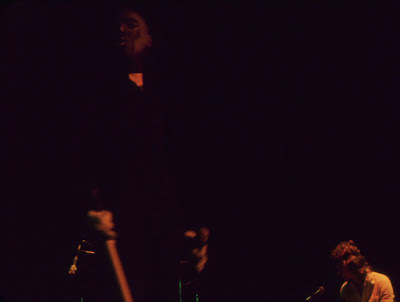 Steve, Tony Banks, and Mike Rutherford were without any theatrics, leaving that to Peter Gabriel. After the concert we waited to meet the band, as did many others. Mike Rutherford, Steve Hackett, and Tony Banks were friendly and generously scribbled their autographs on our paper pads. Peter Gabriel suddenly shot out of the door and dove into the back of a waiting station wagon. No one there, but us, got his autograph. 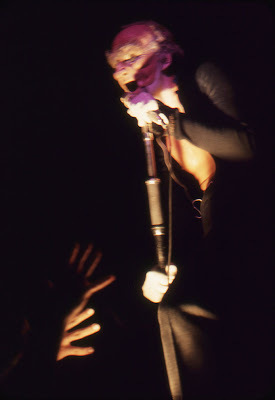 One of the most memorable and exciting concerts that I ever saw, and one of my favorites to photograph. 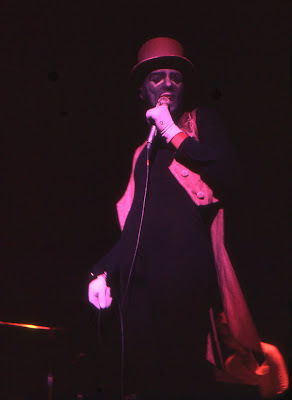 Gary: "An Evening with Genesis" was a real standout among all these great concerts. This was the Selling England by the Pound tour, promoting that LP. They were at the top of their game. We all were listening to Nursery Cryme and Foxtrot, and "Watcher of the Skies" and "Get 'Em Out by Friday" were getting FM radio airplay. Some college radio stations were playing whole sides of their albums (like "Supper's Ready" from Foxtrot). 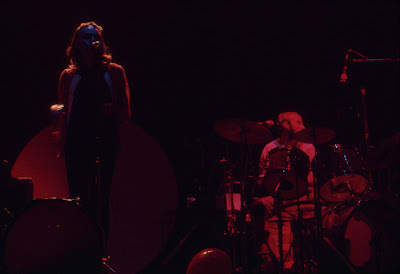 Michael was pointing out things about their writing, showing the difference between Peter Gabriel's writing and the writing by the rest of the band: how the other members wrote rhyming, metrically regular words that were more distant in emotion, while Peter Gabriel's angular, gear-shifting, non metrical writing didn't rhyme as much and was full of asides and comments, often incorporating dialogue and stories into the mix. Peter Gabriel's writing was full of pointed barbs, political opinion, and sexual innuendo, more prose than rhyme. He was sly and devious, very alive. The music itself was very dynamic. Genesis get lumped together with Yes, ELP, and ELO in the prog rock category, but their music was unique. The theatrical aspect made it absolutely that way. Mythic tales and human irony. It had a lot in it. The concert was truly amazing, with the band in fine form. 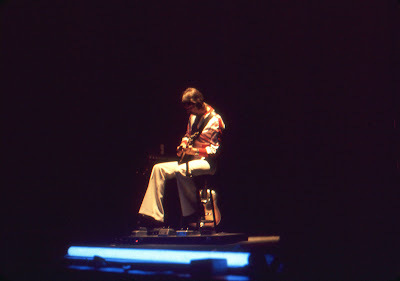 Mike Rutherford, I think, was the real key to this music, playing what must have been a state-of-the-art, dual Rickenbacker bass/twelve string guitar, and playing the most rhythmic rhythm guitar I had ever heard: rapid, odd-metered music juxtaposed exactly with even meters in an almost casual way, pushing the structure of the music forward. 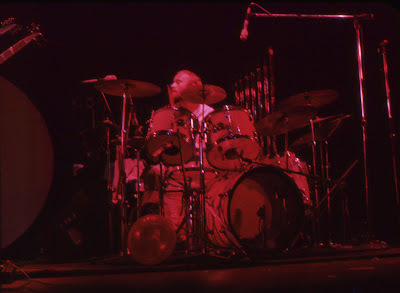 Sometimes he wasn't even playing bass, and he and Phil Collins were really at the core of the complex music. Steve Hackett played those glorious, long, sustained, bent-note melodies over the top, that twinned with the synthesizer and clavinet lines of Tony Banks. 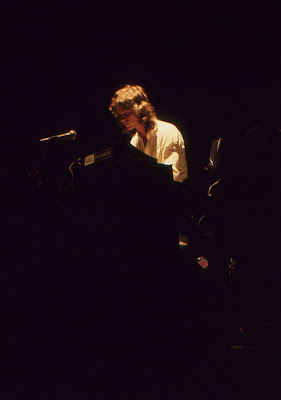 Even though Steve Hackett was sitting while playing, I remember him almost rising out of his chair as he coaxed those lines from his guitar and pedals. 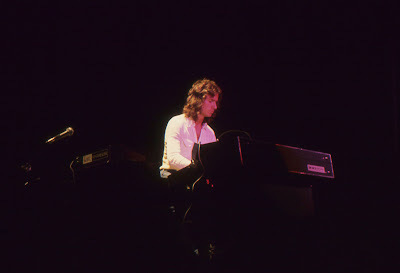 In the more savage pieces, the fierce organ playing of Tony Banks became the driving force along with the bass and drums. 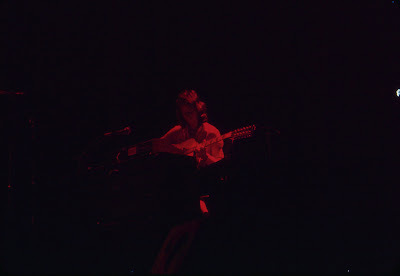 The piano compositions were delivered on an RMI electric piano. It would have been nice to hear a real piano, but it sounded fine. He was an underrated keyboard player. I remember being floored by his playing on "The Cinema Show." 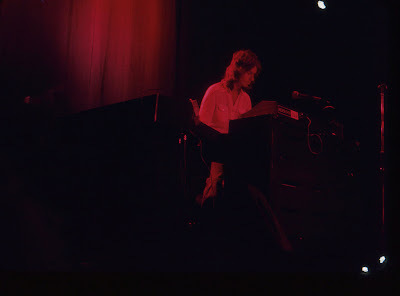 His playing at that time rivaled all the greats (Keith Emerson, Rick Wakeman, Kerry Minnear), but it was a style that he abandoned in later incarnations of the band. At that time, he seemed to me to be almost out of place, belonging more in the Italian renaissance than on a rock stage. 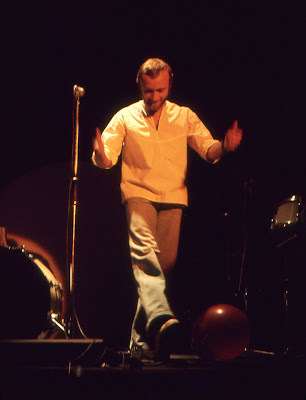 Phil Collins sang one song solo ("More Fool Me," I think), with acoustic guitar backing. 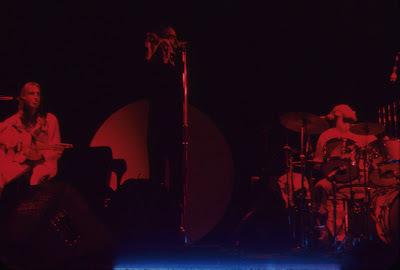 They were all strong musicians, with Peter Gabriel also adding interesting elements with his flute and bass drum. 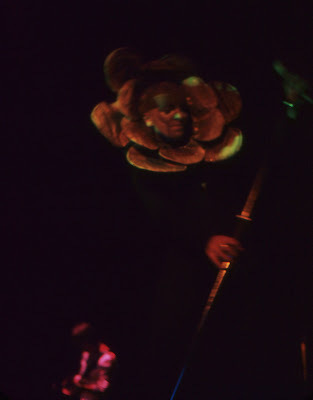 I don't remember seeing Peter Gabriel wearing the head wings during "Watcher of the Skies" (Editor's note: he did, actually), and we definitely didn't see him wear the red dress or the fox head, but we saw everything else that evening: top hat and tails, green and yellow flower, red, white, and blue Britannia with helmet, old man hunched with wrinkled face mask, and the silver suit with face paint during the explosions at the climactic end of Supper's Ready. There were many costume changes. The theatrical performance was stunning. All in all, a fantastic concert. We were talking about this one for a long time. 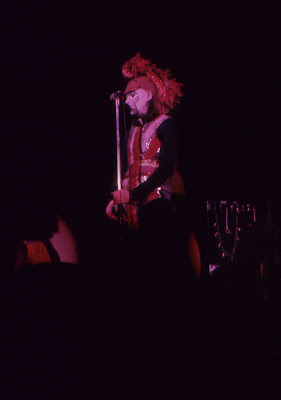 Michael: After listening to several LPs by Genesis, particularly Foxtrot, and reading about their British performances in Melody Maker, I was looking forward to the prospect of seeing them on the stage at Winterland. I knew from what I had read that their performance in San Francisco probably would be something to remember, which turned out to be quite true. As usual, we arrived early at Winterland, and spent the day sitting on the sidewalk near the front doors. Late in the afternoon, as we were passing the time until the show, Phil Collins came walking around the corner, looking for the stage door and taking us completely by surprise. We directed him to the proper door and then quickly ran after him, knowing that the band had come to check the sound. I laughed when first I spotted a young man who apparently had attempted to fashion himself into a rough likeness of Peter Gabriel. I assumed that he merely was a weird fan. A moment later, after looking closer, I saw that it actually was Peter Gabriel himself. He was unshaven, with a fresh tan, and the front bits of his hair had been hacked off, which made him look different from his appearance in photographs. When we approached Peter Gabriel to ask for his autograph, he seemed quite ill at ease. As he nervously signed his name on our scraps of paper, keeping his head down as he did so, and writing in the smallest script that I had ever seen, he kept kicking the heel of his boot against the stage door, presumably wanting it to be opened. He clearly did not enjoy mingling with the public. 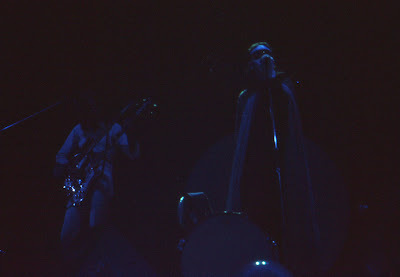 The concert that evening was absolutely stunning. David took some of his best photographs at that show. In particular, Peter Gabriel's performance was utterly astonishing to witness. From the first song, "Watcher of the Skies," to the last, "Supper's Ready," he maintained a fast pace, swiftly changing from one character to another, sometimes in the blink of an eye. 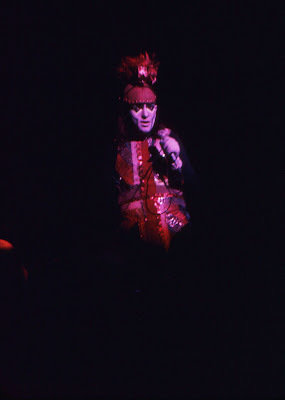 He was the most impressive performer that I had seen since attending a concert by David Bowie in 1972. 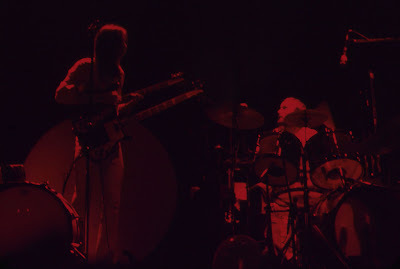 The "Evening with Genesis" that we attended at Winterland set an usually high mark of musical excellence. 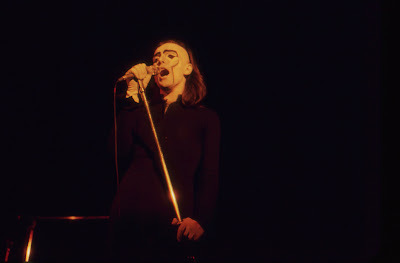 Genesis, with Peter Gabriel standing out, provided the audience with something rare in the world of rock'n'roll: an experience of powerful music that richly combined intellect and imagination, while still carrying a strong measure of excitement. It was, unquestionably, one of the best shows that we ever saw. GREAT! Very informative and enjoyably written. My very first attempt at video "art". It represents one fan's mental images inspired by lyrics from this Gabriel-era Genesis song. Whoa...i can't put in words how i feel...first off their playing at the winterland in san fransico and having all the photos to back it up!! I tip my hat off to you my friend thank you for all this fantastic stuff!! You know..this is a fantastic site on the web, for it brings back so many memories. I went to probably 100 shows at Winterland in the 70's..I would go every weekend and was exposed to so many different types of music. 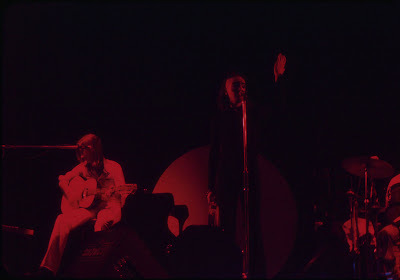 This was my first GENESIS show...and one that changed my life forever in regards to music. 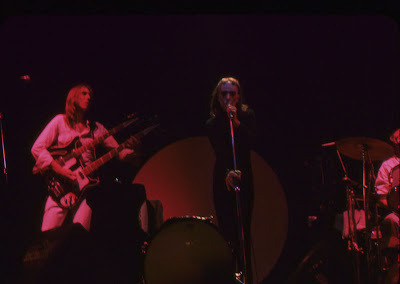 Being a Genesis fanatic since 1974 when I first heard them it is unfortunate for me I didn't learn of them until after this concert at Winterland. 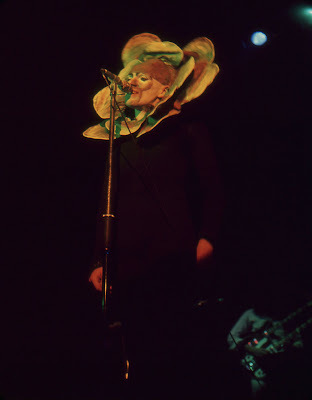 I was at every other Genesis performance beginning with "The Lamb at Berkeley's Community Theatre on January 22nd 1975 the following year. These fantastic photos and recollections of that night in March of '74 are astounding and I know the feelings you expound on here. I thank you for filling me with the emotions of experience as though as I was there that night. 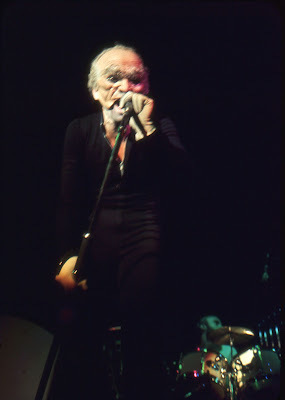 I surely know how memorable and impressionable those Genesis performances were with PG. This page is priceless for any fan of Genesis, whether they were there that night or not! This is much more than just sharing... this is a historical document of musical importance!!! Venus - Thanks for the kind words. We were at the Genesis concert at Berkeley Community that same night and will post our photos and comments in the future. Stay tuned. Hopefully, this audio will see the light of day on wolfgangsvault.com. Thanks for the stories and pictures. Awesome. One of the best shows ever. 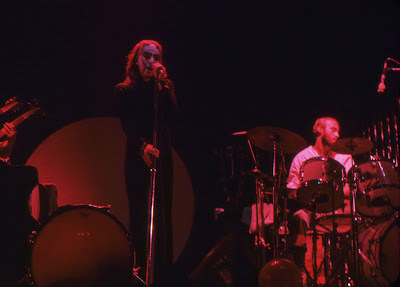 I listened to Genesis on KOME at the time and went to this show with three friends - we were completely blown away. Supper's Ready!! 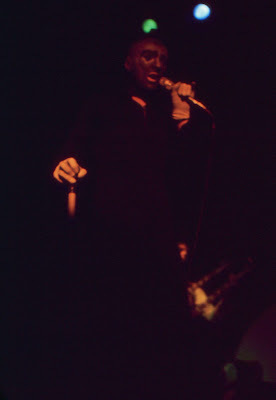 I've been a fan of Peter Gabriel ever since, and saw the Berkeley Community performance of the Lamb the next year. Amazing band. Thanks for sharing these memories and amazing photos - that's a great story about meeting Gabriel at the stage door. Guys, really fantastic. 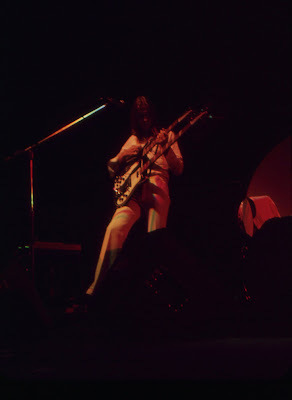 In '74 I was a Brazilian foreign student in the Bay Area (Felton, Sta Cruz Mts) and went to a dozen wonderfully stoned shows in the Winterland and Cow Palace, including Genesis, Yes, Mott the Hoople, King Crimson, Strawbs and Ten Years After - talk about Brit invasion ;-)) Great times! What a show and an amazing adventure.. take care brother!